For those who just love to be outside, an outdoor kitchen is the perfect addition to your home. Escape to your beautiful backyard space with an excuse to cook. Never miss out on a chance to engage with your guests. 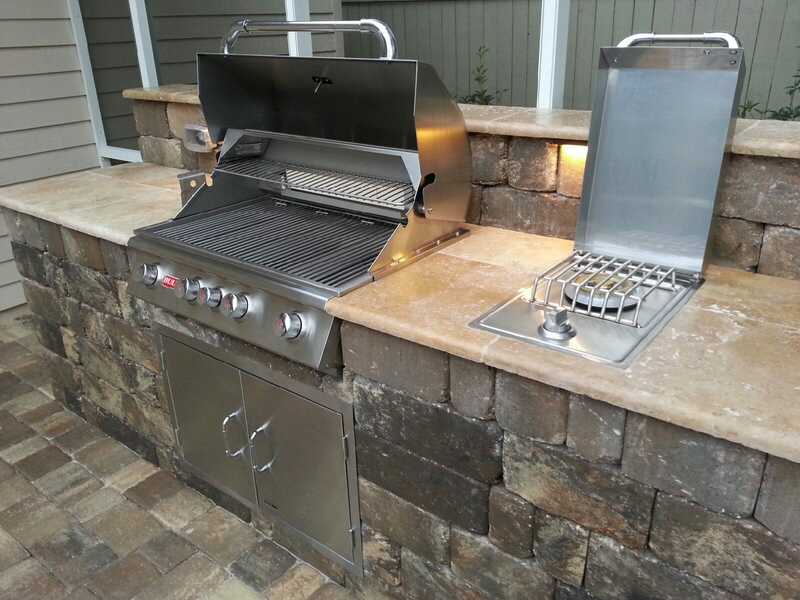 With an outdoor kitchen, you can socialize while you prepare your meal! An outdoor kitchen also makes it easier to keep otherwise smoky and unwanted smells outside of your home. Never have to worry about airing out your home after cooking seafood with your new outdoor kitchen. A kitchen is an essential part of your home. The same can be said for your outdoor entertaining space. Highlight your new outdoor kitchen with lighting or even a pergola to create a beautiful and relaxing space. You may never want to cook inside your home again! Concrete block outdoor kitchen. Block shape-Keystone Stonegate, color-Sierra. Travertine paver countertop with honed and polished edges. Bull Stainless steel kitchen components. Low voltage lighting in backsplash. 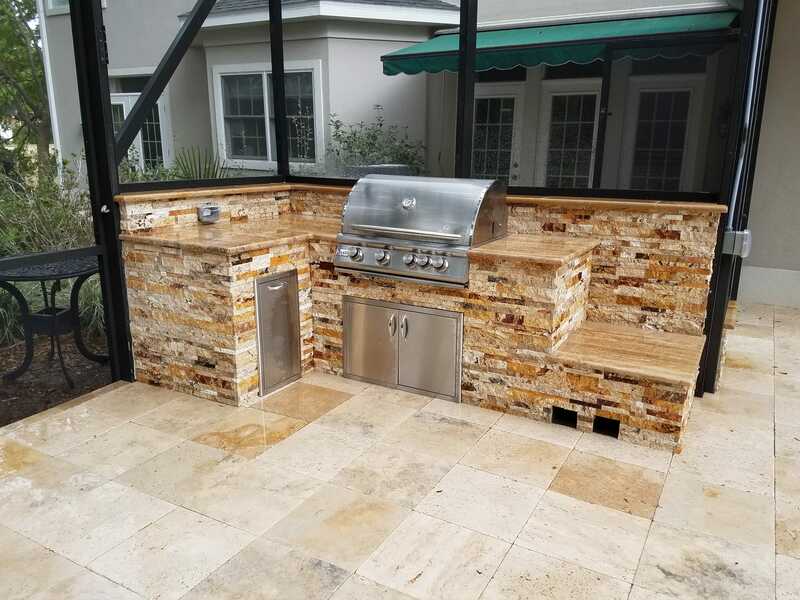 Outdoor kitchen with Scabos travertine split face stone veneer. Stainless steel kitchen components. 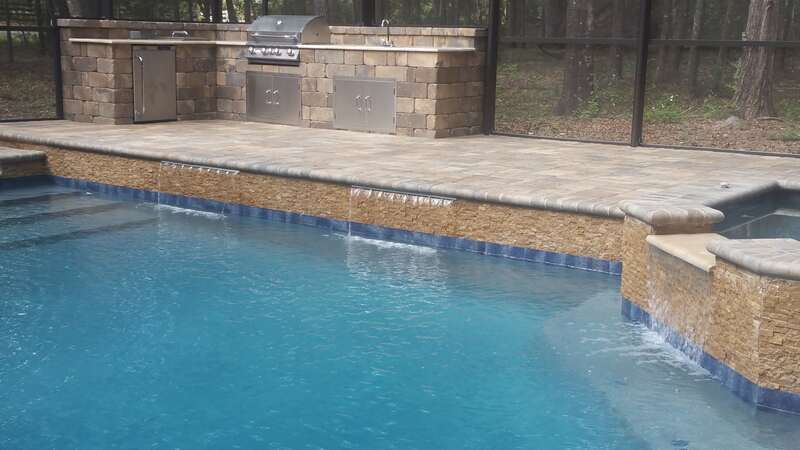 Concrete paver pool deck with outdoor kitchen. Paver shape-Old Town, color-Sierra. Block for kitchen shape-Keystone Stonegate, color-Sierra. Ivory travertine paver countertop. Stainless steel kitchen components. "Did a beautiful job at our house. Perfectionists! So nice to work with." Mary Ann W.